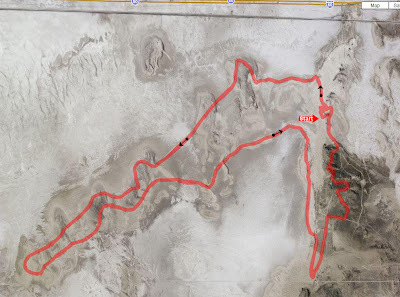 The race loop at Knolls extends South/West of the parking area for Knolls ATV Recreation Area. There are 2 major loops that start and end at the larger dune area. The longer of the 2 goes west and alternates between whoops and mud flats. It's a blast to ride and a real workout in itself. The second loop type ride goes south at the base of the Knolls and returns along the top. There was a bit of snow on the morning I did the Southern loop, which made the upper trail a little more treacherous, but the sand portion was easier, not being as soft as it normally is. It really is a great place to ride, especially this time of year when it's not too hot. The snow Saturday was a little unexpected for this time of year, but you never really know what you'll get during March, and we got both sun and snow this trip.